Even well rooted plants can be rocked by wind and this can be fatal to roses or fruit trees. Shrubs and tree growing at a slant caused by wind will never give of their best. Wind abrades, rips and tears. I have just lost a good spray of chrysanthemums that I was looking forward to seeing in flower. Chrysanthemums stems often break near the joint with the main stem and I should have tied them up with more care or kept them out of the wind. Fleshy leaves like dahlias do not do well in wind. A cold wind does no one any good and the wind chill factor can damage plants as well as gardeners. In severe windy conditions pots can be blown over, loose debris scattered and even structural damage may occur. Pots appear top heavy when there is lots of growth that catches the wind. My clematis and runner beans have caught the wind and both are leaning from the wind. 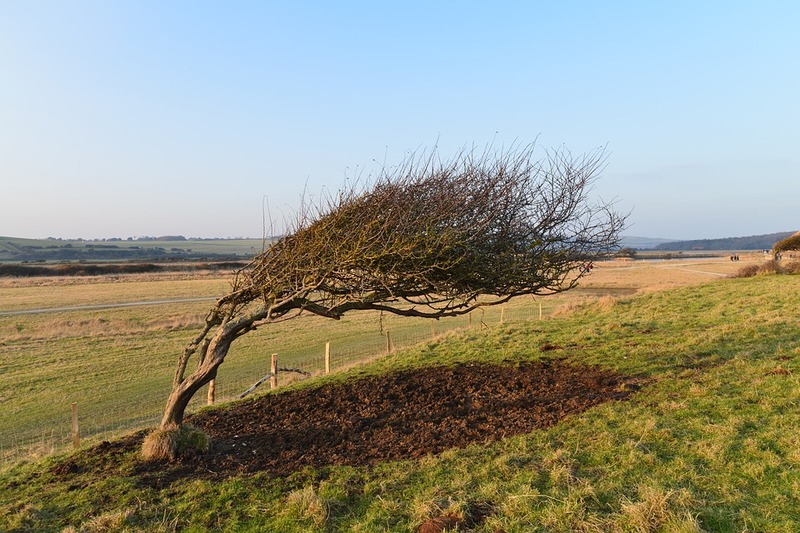 Trees and shrubs can be stunted by wind and will not reach thier normal potential. You seldom see giant trees on our windy coastline.